luxury home, but there are many benefits to including this relaxation space. Reduce stress: Saunas cause your body to release endorphins, which increases your energy level and reduces stress. Soothe sore muscles: Saunas are great for temporary relief to achy muscles and arthritic pain. Maintain healthy skin: Saunas relax facial tension, promote cellular growth and open skin pores. Increase metabolic rate: With regular use, you can burn hundreds of calories per session and increase your overall metabolic rate. However, this is not a diet supplement because you mostly are losing water weighty, which quickly comes back. Improve circulation: The heat brings blood closer to the skin and increases blood flow to the body’s extremities. Rid the body of toxins: Saunas help your body to naturally expel impurities and harmful toxins. Relieve sinus congestion: Have a slight cold or feeling under the weather? 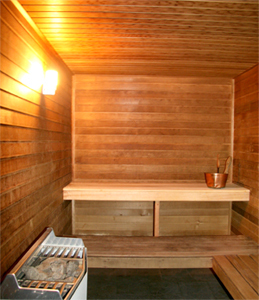 Enjoy a sauna for temporary relief to your symptoms. With of all the benefits, both physical and financially, that a sauna provides, there’s no reason that you shouldn’t have one in your luxury home! Thank you for visiting the Bring Your Luxurious Tastes Outdoors page on Luxury Real Estate Forum.